Budget/Financing, Elections, Governance/Board Decision Making, School Climate, What Can I Do? Jason Shephard emailed a copy of his article on Madison Schools’ Healthcare costs. This article first appeared in the June 10, 2005 issue of Isthmus. 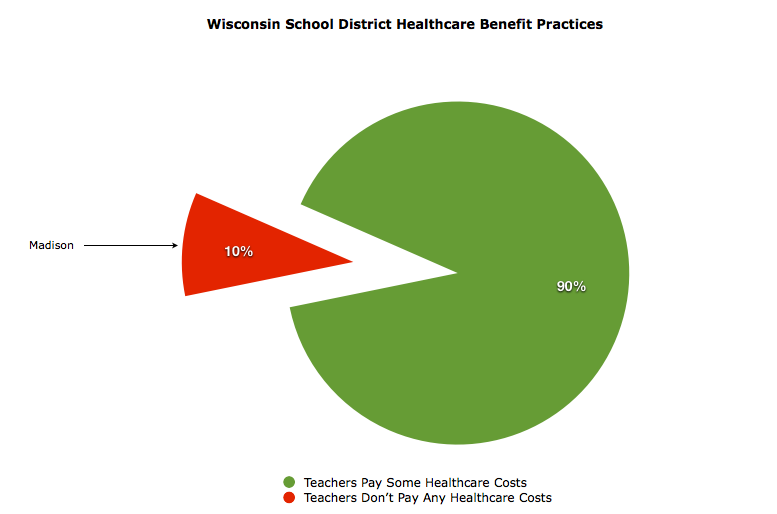 The Isthmus version includes several rather useful charts & graphs that illustrate how the Madison School District’s health care costs compare with the City and County. Pick it up. New York’s Elite Public High Schools Have a Diversity Problem. And Other Cities’ Don’t Look Much Better. The decline and fall of the American university is written in 25-page course syllabi. Get Tech Out of Schools Students interact plenty with technology outside of classrooms, so let’s leave it there. Textbook giants are now teaching classes. Health insurance changes a cure for what ails Madison schools budget? The Madison School District won an historic concession from its teachers union over the last two years — the ability to require that teachers pay part of their health insurance premiums. It came as the district was quickly extending union contracts before a law eliminating most collective bargaining rights took effect, and again while that law was held up in court. But now as the district goes about crafting a 2013-14 budget that — among other cost-savings measures — reduces maintenance spending, freezes equipment budgets and includes no money for new efforts to close the district’s achievement gap, it doesn’t appear there’s much interest in implementing the concession. The budget proposal from new Superintendent Jennifer Cheatham doesn’t subject teachers to health insurance premiums, and that’s fine with School Board President Ed Hughes. “Recent transitions” didn’t keep Cheatham from proposing changes to the district’s salary schedules, though. Madison’s expensive approach to healthcare benefits are not a new subject. Much more on the Madison School District’s 2013-2014 plans for spending and property tax increases, here. It is interesting to compare and contrast Board member amendments to the Administration’s proposed 2012-2013 Madison School District budget. The 2011-2012 budget spent $369,394,753 for 24,861 students or $14,858.40 each. Mary Burke: Require Accountability for All Achievement Gap Programs. Maya Cole offers 11 amendments, the first seeks to address the District’s literacy problems. Cole’s amendment 6 questions the Administration’s use of WPS health care savings (“general fund”). James Howard seeks a student data analysis assistant and the implementation of a parent university. Ed Hughes offers 3 amendments, the first seeks to moderate proposed administrative staffing growth, the 2nd requests $3,000,000 in additional maintenance spending (500K less than the Administrative proposal) and a change (reduction) in the use of the District’s reserves (or “fund equity“). Mr. Hughes’ amendments would result in a 5.7% property tax increase. Related: controversy and a possible audit over past maintenance spending. Beth Moss requests additional middle school media library staffing and increased funding for the middle school Avid program. Much more on the AVID program, here. Marj Passman requests the introduction of a credit recovery program at East High School (the other high schools evidently have in-house programs) and the creation of a “Department of African American achievement”. Arlene Silveira requests $75K for the Superintendent Search and a possible interim candidate, a dropout recovery program, a Toki Middle School “Expeditionary Learning Program” and the creation of an implementation plan for all achievement gap programs. Notes and links on Toki middle school and the “Expeditionary Learning Program“. I continue to wonder if all schools are held to the same academic and financial standards expressed during the debate and rejection of the proposed the proposed Madison Preparatory IB charter school? The Greendale School District’s high-deductible plan has been in place for the past four years but was not available to teachers until last year. When the district first offered the plan, nonunion employees agreed to try it out but teachers declined, Green said. Once Act 10 came into effect, the district offered the high-deductible plan to teachers again. The district allowed teachers to choose between the high-deductible plan and the traditional plan this school year, and 70% decided to go the high-deductible route after seeing how it was working for other staff members, Green said. The district runs the plan in conjunction with a health reimbursement account. In addition to a wellness plan, the Greendale district provides an on-site nurse practitioner from Aurora Health Care. Green said the high-deductible plan significantly reduces the price of health insurance plans for school districts. When factoring in the cost of the high-deductible plan each year plus what the district is putting into the health reimbursement account, the total is about $1,000 less per family plan per year than the traditional plan. Related: The Madison School District recently ended their longtime support of a costly WPS healthcare plan. Since the late 1960’s, MTI members have had the benefit of the best health insurance available. Stressing the importance of quality health insurance in providing economic security, members have made health insurance their #1 priority via their responses to the Union’s Bargaining Survey. And, the Union not only was able to bargain specific benefits, such as acupuncture and extended mental health coverage, as demanded by MTI members, but due to a 1983 MTI victory in the Wisconsin Supreme Court, MTI was able to have an equal voice in which insurance company would provide the plan. This is important because different insurance companies have different interpretations of the same insurance provisions. Unfortunately, the District Administration took advantage of the increased leverage in negotiations enabled by Governor Walker’s Act 10 forcing concessions in health insurance and other Contract provisions in exchange for them agreeing to extend MTI’s five Collective Bargaining Agreements through June 2013. Members of MTI’s teacher bargaining unit, who elected WPS health insurance under old Contract terms, will now lose that coverage June 30, 2012. The District is in the process of distributing materials by which members of the teacher bargaining unit can become familiar with the options available for coverage commencing July 1. They are Dean Health Plan, Physicians Plus and Group Health Cooperative. Each offers an HMO and a Point of Service Plan. The latter carries a higher premium, but enables broader choices for services. The District has scheduled five sessions for those with questions to seek answers from the above-referenced plans. April 9 – Doyle Auditorium -1:00-3:00 p.m.
April 11- La Follette C17 – 4:00-6:00 p.m.
April 17 – Memorial Wisconsin Center – 4:00-6:00 p.m.
April 19 -West LMC – 4:00-6:00 p.m.
April 23 – East LMC – 4:00-6:00 p.m. The Madison School District’s support of the costly WPS health insurance option has been quite controversial over the years. Budget/Financing, Community Partners, Curriculum, Elections, Events, Governance/Board Decision Making, History - Madison Schools, Lifelong Learning, Parenting, PTO Priorities, School Climate, Staff Support, Student Support, Teacher Support, Waste, What Can I Do? The Madison Metropolitan School District Board of Education and the Madison Teachers, Inc. ratified an expedited Collective Bargaining Agreement for 2011-2013. Several significant considerations were ignored for the negative impact and consequences on students, staff and taxpayers. First and foremost, there was NO ‘urgent’ need (nor ANY need at all) to ‘negotiate’ a new contract. The current contract doesn’t expire until June 30, 2011. Given the proposals regarding school finance and collective bargaining processes in the Budget Repair Bill before the legislature there were significant opportunities and expectations for educational, management and labor reforms. With such changes imminent, there was little value in ‘locking in’ the restrictive old provisions for conducting operations and relationships and shutting the door on different opportunities for increasing educational improvements and performances in the teaching and learning culture and costs of educating the students of the district. A partial listing of the missed adjustments and opportunities with the ratification of the teacher collective bargaining agreement should be instructive. Keeping the ‘step and advancement’ salary schedule locks in automatic salary increases; thereby establishing a new basis annually for salary adjustments. The schedule awards increases solely on tenure and educational attainment. This also significantly inhibits movement for development and implementation of ‘pay for performance’ and merit. Continues required union membership. There are 2700 total or 2400 full-time equivalent (FTE) teachers, numbers rounded. Full-time teachers pay $1100.00 (pro-rated for part-time) per year in automatic union dues deducted from paychecks and processed by the District. With 2400 FTE multiplied by $1100 equals $2,640,000 per year multiplied by two years of the collective bargaining unit equals $5,280,000 to be paid by teachers to their union (Madison Teachers Inc., for its union activities). These figures do not include staff members in the clerical and teacher assistant bargaining units who also pay union dues, but at a lower rate. Continues to be the basis for establishing “me too” contract agreements with administrators for salaries and benefits. This has impacts on CBAs with other employee units, i.e., support staff, custodians, food service employees, etc. Each and every one of the above items has a financial cost associated with it. These are the so-called ‘hidden costs’ of the collective bargaining process that contribute to the over-all costs of the District and to restrictions for undertaking reforms in the educational system and the District. These costs could have been eliminated, reduced, minimized and/ or re-allocated in order to support reforms and higher priorities with more direct impact on academic achievement and staff performance. Alarmists in Madison suggest Gov. Scott Walker’s state budget proposal will decimate public education. But Superintendent Dan Nerad’s proposed 2011-2012 budget for Madison School District tells a different story. Launch a new 4-year-old kindergarten program in the fall. Open a charter middle school on the South Side focusing on urban agriculture. Continue to offer free health insurance to employees who select the less-expensive plan. Give teachers small raises based on years of experience and advanced degrees. That’s not to suggest Madison schools are flush with money. Gov. Walker, after all, is trying to balance a giant state budget deficit without raising taxes or pushing the problem further down the road. Walker has proposed cuts to most state programs, including aid to public schools. Gov. Scott Walker says the changes he has rammed through the Legislature will give school districts and local governments “the tools” they need to withstand the severe cuts in state aid his budget will deliver. What he doesn’t get into is how the tensions caused by his agenda will divide the members of these bodies, as they have the state as a whole. One example of this is the Madison school board, where disagreements over the impact of Walker’s actions have spurned an ugly exchange, in which school board member Lucy Mathiak lobbed an F-bomb at a fellow board member, Marj Passman. The exchange happened yesterday, March 14. Passman was contacted by a Madison school teacher who felt Mathiak had been dismissive of the teacher’s concerns, urging her to “get over yourself.” Passman, who allows that board members have been deluged with angry emails, says she expressed to Mathiak that she agreed this response was a little harsh. Suzanne Fatupaito, a nurse’s assistant in Madison schools, is fed up with Wisconsin Physicians Service, the preferred health insurance provider of Madison Teachers Inc.
WPS, with a monthly price tag of $1,720 for family coverage, is one of two health coverage options available to the district’s teachers. The other is Group Health Cooperative, costing $920 monthly for a family plan. During the past year, the Madison school board has reached agreements with other employee groups to switch from WPS to HMO plans, with most of the savings going to boost pay. Lucy has been a long time friend and I have long appreciated her activism on behalf of students, the schools and our community. School districts required to offer health insurance through WEA Trust, a company created by the teachers’ union, would save $68 million a year if employees could switch to the state health plan, Gov. Scott Walker said this week, repeating a claim he made last year. “That’s one of the many examples of why it’s so critically important to change collective bargaining,” Walker said at a news conference Monday before bringing up the issue again in his public address Tuesday. Madison-based WEA Trust, created by the Wisconsin Education Association Council, disputes the claim. The insurer says it provides lower-cost choices, and districts can already join the state health plan. “It’s been an option for them for some time,” said WEA Trust spokesman Steve Lyons. About 65 percent of the state’s school districts contract with WEA Trust, covering about 35 percent of school employees. Several large districts, including Green Bay, Madison and Milwaukee, don’t offer the plan. The cost of providing WPS coverage to Madison teachers has long been controversial. After years of watching escalating health insurance costs eat up and even surpass the savings provided by early retirements, some public school districts are getting tough in contract negotiations to reduce benefit levels. The Hartland-Lakeside School Board and its teachers union went to arbitration in mid-December as district officials sought to cap insurance benefits and lower a stipend given to retiring teachers. The Waukesha School Board has gone even further, denying almost all early retirement requests by teachers for the past two years as it advances toward arbitration in contract negotiations. Health care cost growth has also been an issue locally. A PARADOX of education is that presenting information in a way that looks easy to learn often has the opposite effect. Numerous studies have demonstrated that when people are forced to think hard about what they are shown they remember it better, so it is worth looking at ways this can be done. And a piece of research about to be published in Cognition, by Daniel Oppenheimer, a psychologist at Princeton University, and his colleagues, suggests a simple one: make the text conveying the information harder to read. Dr Oppenheimer recruited 28 volunteers aged between 18 and 40 and asked them to learn, from written descriptions, about three “species” of extraterrestrial alien, each of which had seven features. This task was meant to be similar to learning about animal species in a biology lesson. It used aliens in place of actual species to be certain that the participants could not draw on prior knowledge. Half of the volunteers were presented with the information in difficult-to-read fonts (12-point Comic Sans MS 75% greyscale and 12-point Bodoni MT 75% greyscale). The other half saw it in 16-point Arial pure-black font, which tests have shown is one of the easiest to read. Milwaukee County Executive Scott Walker proposed a plan he says would potentially save school districts and local units of government more than $300 million in health care costs. Walker, a Republican candidate for governor, said his proposal would allow local units of government to switch from health plans that have high premiums to the state’s lower-cost employee health plan. Walker said his proposal could save school districts $68 million and local governments up to $242 million annually in health care costs. He cautioned, however, that the savings estimate for local units of government is impossible to estimate because there is no central database of what municipalities pay for health care. To make his projections, he used data of the potential savings at school districts and applied those figures to the state’s more than 200,000 local public employees. Walker said the biggest reduction would come from Milwaukee Public Schools, which he said could realize $20 million a year in savings. Locally, the Madison School District’s use of WPS has long been controversial due to its high cost versus alternatives, such as GHC, among others. Though shrouded in the overly formal language of district documents, new amendments to the proposed 2010-’11 Milwaukee Public Schools budget signal an ultimatum to unions from the Milwaukee School Board: Accept changes to your health care and be open to a furlough, or watch your colleagues be laid off next year. In a Strategic Planning and Budget Committee meeting Thursday night that carried into Friday morning, the board got its first chance to discuss and act on amendments to the administration’s proposed $1.3 billion budget, which calls for an estimated 150 to 200 teacher layoffs and hundreds of other staff job eliminations. Amendments that direct changes to the health-care plan and the implementation of furloughs would require an agreement with labor unions that represent certain employees. But the board’s amendments could set the ball in motion for those discussions. One of those included restoring about a third of the positions set to be eliminated for teachers, paraprofessionals and general education aides, but only if those bargaining units – namely, the Milwaukee Teachers’ Education Association – agree to accept the less expensive health care plan. This is not a new topic. Some elements of the Madison School District have sought similar changes. ata from the NCAA’s most recent study on revenue and expenses [6MB PDF Complete Report] at Division I institutions show a slight moderation in the rate of spending in the aggregate within the division and a reduced growth in the gap between the so-called “haves” and “have-nots,” though the gap continues to be wide. The report summarizing Division I athletics program finances between 2004 and 2008 also reveals that 25 schools – all in the Football Bowl Subdivision – reported positive net revenue for the 2008 fiscal year, six more than in the 2006 fiscal year. Only 18 FBS institutions, however, have reported revenue over expenses when the data from all five years are aggregated. The findings make NCAA officials cautiously optimistic that the advice from former NCAA President Myles Brand’s Presidential Task Force three years ago to moderate spending is being heeded, though those same officials acknowledge that these data through the end of the 2008 fiscal year (June) do not reflect the subsequent economic downturn that may reveal a different story on spending in next year’s report. Schools are doing a better job of identifying students who are eligible for free or reduced-price school lunches, but some states are much better than others, the Agriculture Department says in a report to Congress. In 2008-2009, 78 percent of schools identified eligible students by using government records of which households already receive aid like food stamps. Use of the so-called direct certification method, the most efficient way to enroll school children in subsidized lunch programs, was up 11 percentage points from the previous year, according to the report, which is being delivered to Congress on Tuesday. A copy was obtained by The Associated Press. Direct certification helps eliminate the lengthy application process for free meals. Despite the overall improvement, the report shows a wide disparity in performance from state to state. The top four states – Alaska, Delaware, New York and Tennessee – all directly enrolled more than 90 percent of students from households that receive food stamps. Spending more, adding extracurricular activities and increasing the percentage of students deemed advanced on state tests could help Wisconsin school districts that want to attract more students through the state’s open enrollment program. “There’s a lot of surveys saying parents want this or they want that, but when they actually have to take their kid and drive them to school, that reveals what they really want in a school district,” said David Welsch, an assistant professor of economics at the University of Wisconsin-Whitewater and lead author of the study, which is slated for publication in the Economics of Education Review. Under the state’s open enrollment program, which has been in effect for more than a decade and now serves more than 28,000 students, students can attend any public school district in Wisconsin so long as there is room and they provide their own transportation. State aid – nearly $6,500 this school year – accompanies each open enrollment transfer. One of the most striking findings in the recent study was that students were more likely to transfer from districts with higher property values and lower tax rates to districts that spend more per pupil. For every $100 difference in spending per student, a higher-spending district could expect about 1.7% more incoming transfers. Wisconsin Open Enrollment: Part Time / Full Time. By now, we’re sure that you are aware of a video placed on the Internet that has been reported heavily by the media. The video is of a class of students singing a song about President Obama. Over the past two days we have been able to learn more about this situation and would like to provide you with some additional information. The song was one of eight skits performed during a February 2009 program that included second grade classes. Parents attended the program which took place on February 27, 2009. The other skits in the program included Groundhog Day, Chinese New Year, Abraham Lincoln, Valentine’s Day, George Washington, Mardi Gras, and Dental Health Month. The song about President Obama was in recognition of Black History Month. We have been informed that the lyrics of the song were sent home with the children in advance of the assembly, which was the teacher’s normal procedure. There were no concerns or complaints prior to, during, or after the program. On March 23, 2009, an author visited the Young School as part of the school’s Women’s History Month recognition. As is usual procedure, parents were notified prior to the visit and invited to attend. The author presented two assemblies during which she read from two of her books. She also met with the Teen Book Club at our high school and did an evening book signing for parents and children. The author was accompanied by two individuals. After the first assembly on March 23rd, the class that performed the song at the February assembly about President Obama provided a special performance for the author, since one of the books she wrote was about Barack Obama. We were informed by a representative of the author that one of the individuals who accompanied the author video recorded the performance. School staff had no knowledge of the recording. The Madison Metropolitan School District and Madison Teachers Inc. reached a tentative agreement Tuesday evening on the terms and conditions of a new two-year Collective Bargaining Agreement for MTI’s 2,600 member teacher bargaining unit. Negotiations began April 15. The Contract, for July 1, 2009 to June 30, 2011, needs ratification from both the Board of Education and MTI. The Union will hold its ratification meeting on Wednesday, October 14, beginning at 7:00 p.m. at the Alliant Energy Center, Dane County Forum. The Board of Education will tentatively take up the proposal in a special meeting on October 19 at 5:00 p.m.
A key part of this bargain involved working with the providers of long term disability insurance and health insurance. Meetings between MTI Executive Director John Matthews and District Superintendent Dan Nerad and representatives of WPS and GHC, the insurance carriers agreed to a rate increase for the second year of the Contract not to exceed that of the first year. In return, the District and MTI agreed to add to the plans a voluntary health risk assessment for teachers. The long term disability insurance provider reduced its rates by nearly 25%. The insurance cost reductions over the two years of the contract term amount to roughly $1.88 million, were then applied to increase wages, thus reducing new funds to accomplish this. The new salary schedule increase at 1% per cell, inclusive of Social Security and WRS, amount to roughly $3.04 million. Roughly 62% of the salary increase, including Social Security and WRS, was made possible by the referenced insurance savings. Inclusion in the Contract of criteria to enable salary schedule progression by one working toward the newly created State teacher licensure, PI 34. Under the new Contract provision, one can earn professional advancement credits for work required by PI 34. Additive pay regarding National Board for Professional Teaching Standards, i.e. an alternative for bargaining unit professionals who are not teachers (nurses, social workers, psychologists, et al) by achieving the newly created Master Educator’s License. Continuance of the Teacher Emeritus Retirement Program (TERP). The ability after retirement for one to use their Retirement Insurance Account for insurance plans other than those specified in the Collective Bargaining Agreement. This will enable one to purchase coverage specific to a geographic area, if they so choose, or they may continue coverage with GHC or WPS – the current health insurance providers. For elementary teachers, the frequency and duration of meetings has been clarified, as have several issues involving planning time. All elementary teachers and all elementary principals will receive a joint letter from Matthews and Nerad explaining these Contract provisions. For high school teachers who volunteer for building supervision, there is now an option to enable one to receive compensation, rather than compensatory time for the service. And there is a definition of what “class period” is for determining compensation or compensatory time. For elementary and middle school teachers, MTI and the District will appoint a joint committee for each to study and recommend the content and frequency of report cards. For elementary specials (e.g. art, music) teachers, the parties agreed to end the class and a half, which will mean that class sizes for specials will be similar to the class size for elementary classroom teachers. For coaches, and all others compensated on the extra duty compensation schedule, the additive percentage paid, which was frozen due to the State imposed revenue controls, will be restored. School year calendars were agreed to through 2012-2013. The NCAA Graduation Success Rate (GSR) and the Academic Success Rate (ASR) were developed in response to college and university presidents who wanted graduation data that more accurately reflect the mobility among college students today. Both rates improve on the federally mandated graduation rate by including students who were omitted from the federal calculation. The GSR measures graduation rates at Division I institutions and includes students transferring into the institutions. The GSR also allows institutions to subtract student-athletes who leave their institutions prior to graduation as long as they would have been academically eligible to compete had they remained. The ASR measures graduation rates at Division II institutions and is very similar to the GSR. The difference is that the ASR also includes those freshmen who were recruited to the institution but did not receive athletics financial aid. Whitman is a terrific reporter whose 365-page paperback, published by The Thomas B. Fordham Institute, provides a lively, readable and exhaustive account of this fast-growing phenomenon. Whitman focuses on six schools that represent different forms of this approach–the American Indian Public Charter School in Oakland, the Amistad Academy in New Haven, the Cristo Rey Jesuit High School in Chicago, the KIPP Academy in the South Bronx, the SEED public charter school in Washington, D.C. and the University Park Campus School in Worcester, Mass. The profiles of the schools and their founders are well-written. Whitman’s analysis of what has made them work is thoughtful and clear. My problem is this: I hate his subtitle, “Inner-City Schools and the New Paternalism.” And I like his decision to refer to this group as “the paternalistic schools” even less. Nearly 200 employees of the Madison School District who currently have health insurance provided by Wisconsin Physicians Service will lose that option, saving the district at least $1.6 million next year. But the real savings in eliminating what has long been the most expensive health insurance option for district employees will come in “cost avoidance” in the future, said Bob Nadler, director of human resources for the district. “It’s a big deal for us – it really is,” Nadler said. “It certainly will be a benefit to both our employees and the taxpayers,” said Superintendent Art Rainwater, adding that the savings were applied to salary increases for the employees affected. The change, which will take effect Aug. 1, is the result of an arbitrator’s ruling that allows the district to eliminate WPS coverage as an option for members of the clerical unit of Madison Teachers Inc., and instead offer a choice of coverage by Group Health Cooperative, Dean Care or Physicians Plus at no cost to employees. Those employees previously had a choice between only WPS or GHC. Currently, the district pays $1,878.44 a month for each employee who chooses WPS family coverage and $716.25 for single coverage. For Dean Care, the next highest in cost, the district will pay $1,257.68 per employee a month for family coverage and $478.21 for single coverage. This year, WPS raised its costs more than 11 percent while other providers raised their costs by 5 percent to 9 percent, Nadler said. The high cost of WPS insurance has been a frequent topic in recent Madison School Board races and referendums. Jason Shephard: WPS Insurance proves costly. The tradeoff between WPS’s large annual cost increases, salaries and staff layoffs will certainly be a much discussed topic in the next round of local teacher union negotiations. Budget/Financing, Elections, Governance/Board Decision Making, Health Care, History - Madison Schools, School Climate, What Can I Do? Budget/Financing, Elections, Governance/Board Decision Making, School Climate, Staff Support, Student Support, Teacher Support, What Can I Do? Spring 2007 Madison School Board Election Update: Vote April 3! Curriculum, Elections, Governance/Board Decision Making, History - Madison Schools, School Climate, Special Education, What Can I Do? What’s the MTI political endorsement about? Collaboration or collusion: What should the public expect from MMSD-MTI Task Force on Health Insurance Costs?